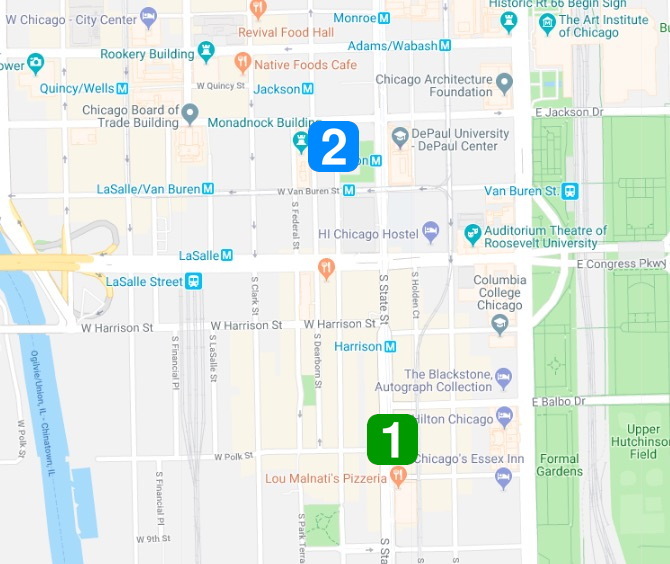 A Loop resident told police that a group of men that he invited to view artwork in his apartment suddenly pulled out guns and robbed him of his sculptures on Thursday afternoon. No one is in custody. Police said the victim and two friends invited three others to an apartment in the 70 block of South State to view glass sculptures around 2:30 p.m. The viewing turned sour when the guests pulled out a gun, restrained their hosts with duct tape, and then escaped with an estimated $22,000 worth of art, according to police. The victim said the offenders are three men—two white and one black—all of whom are about 27-years-old and of average height and weight. Meanwhile, in more traditional Loop robbery news: A woman was pushed to the ground and robbed of her phone at 67 West Jackson on Wednesday afternoon. The victim was walking when four male teenagers jumped her around 3 p.m.
After the robbery, the offenders split up and fled in separate directions. They are described as four thin black males between 15- and 17-years old. The primary offender wore black jeans with a red True Religion sweatshirt. Another wore jeans, a black hoodie, and brown shoes. The third wore black Air Force 1 shoes with black jeans and a NorthFace brand hoodie. The final suspect wore light-colored jeans, black shoes, and an off-white hoodie with lettering on the front. Police believe the same crew was responsible for another attack in the Loop on Tuesday. Cops issued a warning Thursday about muggings near Red Line stations in the downtown area.